A U.S. Circuit Court ruling upholding Pennsylvania’s law governing the funeral industry is good news for the public, according to local funeral directors and their state agency. The latest ruling reversed a lower court ruling issued two years ago. In 2008, a small group of funeral directors sued the Pennsylvania State Board of Funeral Directors and two officials involved with investigating funeral homes for licensing violations. The plaintiffs alleged that 12 provisions of the state’s 1952 Funeral Director Law were unconstitutional. In 2012, U.S. District Court Judge John Jones in Harrisburg struck down 11 regulations; one of the original 12 counts was withdrawn by the time he got the case. Last week, however, a three-judge panel in the Third Circuit Court of Appeals declared that nine of the 11 provisions are constitutional. Among them were the ability for the state to conduct random funeral home inspections and a ban on paying commissions to unlicensed salespeople or agents to secure business. The appeals court also upheld the 100-percent trusting provision, which requires that all money paid for pre-arranged funerals be put into a trust for the customer’s benefit until his or her death. The plaintiffs wanted all of the money paid for services to go into trusts, but only 70 percent of customers’ payments for merchandise such as caskets or vaults are required to go into trusts. JoAnn Pavlic, supervisor of the Leonard M. Pavlic Funeral Homes Inc. in Charleroi, is a past president of the Pennsylvania Funeral Directors Association. She said the initial lawsuit did not represent the funeral directors as a whole. In fact, she said, the plaintiffs represented less than a quarter of one percent of all operating in the business. “It’s a great win for the consumers and the funeral directors alike,” Pavlic said with reference to the recent court ruling. Pavlic said the state board sets a higher standard for the funeral industry. “There are always tweaks that need to be made and that could be made to laws, to bring them up to date,” Pavlic said. “I believe the state board realizes that, but it’s a process. Nothing can occur except through the Legislature. The Circuit Court ruling means “everything goes back to square one,” said Tim Billick, supervisor of the Dalfonso-Billick Funeral Home Inc. and Cremation Services in Monessen. But, he said, the recent ruling may lead to modernization of the 62-year-old state law that governs funeral home operations. “It’s a win for the consumers because we’re still going to be monitored like the way we were before,” Billick said. The State Board of Funeral Directors dragged its feet on updating the law, Billick said, leading to the lower court’s decision that the state law was unconstitutional. For example, while Billick said he is not a proponent of serving food in a funeral home, he said if it is regulated, refreshments could be a welcome break for families, especially during long visitations. “In any profession, you have to upgrade and update the way the consumer requests things to be done,” Billick said. John Eirkson, executive director of the Pennsylvania Funeral Directors Association, said trusting, commissions and inspections were the top concerns for his organization and its members. He said the suit represented just four funeral homes statewide and the association was opposed to the suit. “We think for public protection and safety there should be inspections of funeral homes for health reasons,” Erikson said. He said the association also opposed paying commissions to independent agents to direct business to a funeral home. And all funeral homes should have preparation rooms, Erikson said. While some have advocated for change in the Funeral Director Law, Erikson believes it still has purpose. “Because the law is old doesn’t mean it’s bad,” Erikson said. Chris Buckley is a staff writer for Trib Total Media. He can be reached at 724-684-2642 or cbuckley@tribweb.com. This entry was posted in Uncategorized on February 28, 2014 by ASTYDigitalRegistry. Cremation costs can vary by thousands of dollars. This is is an important factor when considering funeral costs and cremations costs. We have addressed this subject in several places before,-it is important to address this subject again. You can view a video on this with more info here. As with funeral cost, and cremation cost- it is very important to shop around. “I just told ’em I wanted the bare basic just the ashes in a box no services no nothing,” he says. This entry was posted in Uncategorized on February 20, 2014 by ASTYDigitalRegistry. These games have a lot of talk about personal loss. Amongst the praise and excitement for the American sweep in men’s slopestyle skiing, an NBC announcer mentioned the father of Utahn and gold medalist Joss Christensen died last year. Like a lot of people in Utah, my wife and I have been watching the Winter Olympics every evening. After a few nights, I noticed a disproportionately high number of mentions about death. A lot of athletes seem to have suffered the loss of a loved one, be it a parent (Christensen), a sibling (Bode Miller) a coach (Patrick Chan) or a teammate (just about every Canadian and freestyle skier who knew Sarah Burke). Apparently, I’m not the only one who noticed this. On Saturday, Los Angeles Times media critic Steven Zeitchik published a column criticizing NBC anchor Meredith Vieira. During her interview with Utah skeleton racer Noelle Pikus-Pace, Vieira suddenly brought up how Pikus-Pace had a miscarriage. But in doing some research, I found NBC isn’t the only one discussing death. The Salt Lake Tribune mentioned Pikus-Pace’s miscarriage, too. ESPN, USA Today and The Washington Post have all published stories on their websites making some mention of a death relevant to an athlete. I found similar stories from the Associated Press, Reuters and the Agence France-Presse — three wire services whose content is published or broadcast by thousands of news outlets across the world. Here is a running spreadsheet of athletes at the Sochi Olympics who have been associated with the death of someone. Did I miss a story? Email me at ncarlisle@sltrib.com or tweet to @natecarlisle. Nate Carlisle is The Salt Lake Tribune’s military reporter and a lifelong sports fan. 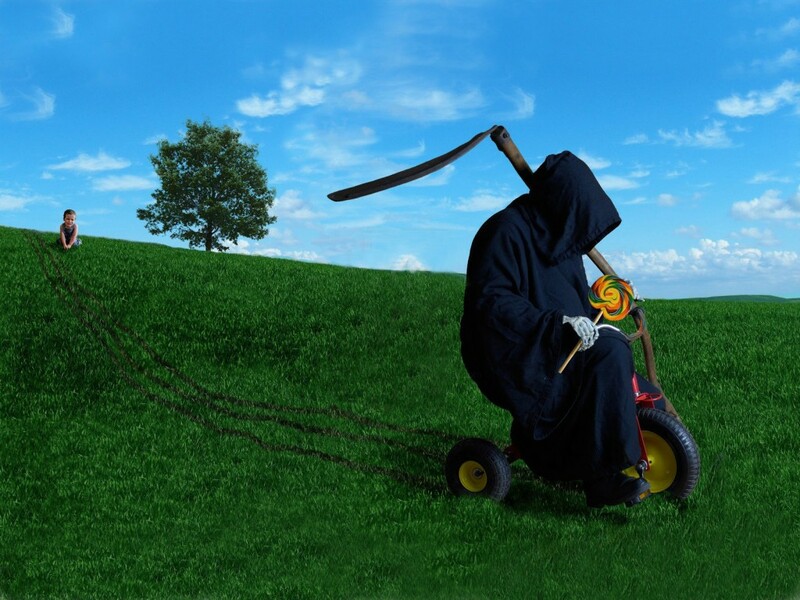 The Grim Reaper would make an outstanding marketing executive. This entry was posted in Uncategorized on January 31, 2014 by ASTYDigitalRegistry. Navy Seal’s Dog Refuses To Leave Owner’s Funeral. Most Beautiful Thing I’ve Ever Seen. Jon Tumilson always wanted to be a Navy Seal. He died living that dream. He perished while serving his country in Afghanistan in an chopper crash, leaving behind so many family members – including his Labrador, Hawkeye. At his funeral, Hawkeye led his family into the services. What happened next is a tribute to the undying love between man and dog. This entry was posted in Uncategorized on January 22, 2014 by ASTYDigitalRegistry. Are You Ready For Digital Registry in 2014? A Simple Thank You Helps You Decide. We’re on the verge of 2014 and there is no denying that it is a technological world out there. A Simple Thank You is leading the way in funeral industry technology. Their digital registry system and FREE application is revolutionizing the traditional guest book, enhancing funeral service offerings and making pre-need marketing seemingly effortless. That is only the beginning of what A Simple Thank You offers. All of these benefits aside, A Simple Thank You’s greatest impact is felt by the family. Digital registries offer funeral homes and their clients an opportunity to digitally capture, store, and organize guest contact information. In addition, this innovative technology helps simplify and automate the generation of print materials including: custom guest books, address labels, envelopes, and memorial pages. As a funeral director, one of your primary goals is to exceed family expectations. A digital registry offering streamlines the collection of guest information and simplifies the acknowledgement card process for your families helping to minimize the stress associated and ease their burden. The addition of this service enables you to continue to help families through the grieving process even after they have said their final goodbyes. Am I Ready For Digital Registry? YES, but first let’s focus on the family. When returning home from the cemetery or a memorial service, not only has their world been turned upside down by losing a loved one, but now the family has to begin the first steps in moving forward without them. As a funeral home, you help the family prepare and manage the services. Offering A Simple Thank You digital registry is a way your funeral home can help grieving families days, weeks, or even months after the service. A Simple Thank You’s free iPad application allows guests to sign in, eliminating the frustrating illegible handwriting and incomplete guest information. At the completion of the service, a memorial guest book, customized acknowledgement cards and addressed envelopes are prepared. In many communities it is customary to send acknowledgement cards to all persons that have attended a service. While in other communities acknowledgement cards are only sent to those who provided food, flowers, donations, and childcare among many other acts of kindness to support the families in their time of need. A Simple Thank You empowers the family to contact all guests, family members and friends without having to search for addresses. Let’s not forget about the amazing advantages that digital registry offers funeral homes. If you take advantage of A Simple Thank You’s full service you will never have to stock memorial books or acknowledgement cards again! A Simple Thank You offers a complete package that allows your families to choose from 15 different memorial books with matching acknowledgment cards (including some great options that have been offered due to the partnership with A Simple Thank You and Bass-Mollett Publishers). You will free-up space in your funeral home, save valuable staff time not having to print memorial books, and instead be there to support your families or greet guests as they enter and exit your funeral home. With A Simple Thank You’s quick turn-around on the printing and shipping, it may make sense to save your funeral home the time and money. Your completed packages can be shipped directly to the family or if you prefer that additional personal contact, the package can be shipped straight to the funeral home. You’re Intrigued By The Idea of Digital Registry But Would Rather Keep the Printing In House? A Simple Thank You offers an in-house print option as well. Your funeral home can print the memorial pages, acknowledgement cards and address labels with an affordable monthly or annual fee. Most digital registry pricing can cause a major headache for set up, equipment, additional devices, live training for funeral homes, video tutorials and device data plans. A Simple Thank You has structured an all inclusive, non-complex pricing scale for their customers. Funeral homes have the option of purchasing the equipment on their own or they can select equipment through A Simple Thank You’s turnkey solution. There is no taxing investment required, startup or application fees. The only self startup cost required would be the purchase of an iPad and a $99 bracket for its security and protection. Here is why digital registry is a logical step forward for the funeral industry: Most simply put, it is only an option. While some funeral homes use A Simple Thank You exclusively, most use the digital registry as a compliment to the traditional guest book. Some feel more comfortable using the traditional guest book but may not anticipate what monumental task they are about to endure after they have said goodbye. ASTY MOBILE: Sign our digital registry for a selected service from anywhere in the world. Search by “Name of the Deceased” or “Name of Funeral Home” then choose service. It’s that Simple! How Will Elderly Guests React To Digital Registry? This is a frequent concern among funeral directors. The funeral homes that are currently using digital registry have come up with some great ideas to overcome this “issue”. The first solution is to provide an attendant to help those in need of assistance. Not only are you helping the family but you are also offering customer service to those that could potentially be future clients. A second but most commonly used solution is informing the family that some may not be completely comfortable providing their information into the guest book. A great approach might be utilizing tech-savvy grandchildren, nieces or nephews that might be interested in helping during the services. There is no additional cost to the family or funeral home and it presents the tweens and teens with a fulfilling job to perform during the services. The benefits that offering A Simple Thank You provides your families, funeral home and bottom line are increasingly evident in today’s marketplace. Once you decide to offer A Simple Thank You digital registry call them at (800) 483-0671. A Simple Thank You can offer bracket suggestions to secure your iPads through http://www.usaenclosures.com, offer FREE webinar training for your staff members and industry leading 24-hour customer service. If you would like to schedule a live webinar, please email us at info@asimplethankyou.com. Fill out the form below, go digital today and gain the advantage over your competition. This entry was posted in Uncategorized and tagged a simple thank you, digital registry, director, Funeral, guest book, home, news, sign-in on December 30, 2013 by ASTYDigitalRegistry. Alsip, IL – Chicago-based company, A Simple Thank You would like to offer those who are unable to attend the services for the Former President Nelson Mandela the option to sign the condolence book from anywhere in the world. The South African Consulate General in Chicago has opened the option to allow people to sign the condolence book at two physical locations or to sign the condolence book on the electronic registry. By using the following link, guests can use their smartphone, tablet or computer to sign the guestbook. A Simple Thank You would like to encourage people to pay their respects to President Mandela for his inspiration and leadership. This entry was posted in Uncategorized on December 9, 2013 by ASTYDigitalRegistry.